Bali is an Indonesian island located at 8°25′23″S, 115°14′55″ECoordinates: 8°25′23″S, 115°14′55″E, the westernmost of the Lesser Sunda Islands, lying between Java to the west and Lombok to the east. It is one of the country's 33 provinces with the provincial capital at Denpasar towards the south of the island. The island is home to the vast majority of Indonesia's small Hindu minority. It is also the largest tourist destination in the country and is renowned for its highly developed arts, including dance, sculpture, painting, leather, metalworking and music. Bali has been inhabited since early prehistoric times firstly by descendants of a prehistoric race who migrated through mainland Asia to the Indonesian archipelago, thought to have first settled in Bali around 3000 BC. Stone tools dating from this time have been found near the village of Cekik in the island's west. The end of the prehistoric period in Indonesia was marked by the arrival of Hindu people from India around 100 BC as determined by Brahmi inscriptions on potsherds. The name Balidwipa has been discovered from various inscriptions, including the Blanjong charter issued by Sri Kesari Warmadewa in 913 AD and mentioning Walidwipa. 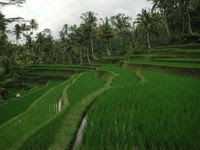 It was during this time that the complex irrigation system subak was developed to grow rice. Some religious and cultural traditions still in existence today can be traced back to this period. The Hindu Majapahit Empire (1293–1520 AD) on eastern Java founded a Balinese colony in 1343. When the empire declined, there was an exodus of intellectuals, artists, priests and musicians from Java to Bali in the 15th century. The First European contact with Bali is thought to have been when Dutch explorer Cornelis de Houtman arrived in 1597, though a Portuguese ship had foundered off the Bukit Peninsula as early as 1585. Dutch rule over Bali came later, was more aggressively fought for, and they were never ultimately able to establish themselves as they had in other parts of Indonesia such as Java and Maluku. In the 1840s, a presence in Bali was established, first in the island's north, by playing off various distrustful Balinese realms against each other. The Dutch mounted large naval and ground assaults first against the Sanur region and then Denpasar. The Balinese were hopelessly overwhelmed in number and armament, but rather than face the humiliation of surrender, they mounted a final defensive but suicidal assault, or puputan. Despite Dutch pleas for surrender, an estimated 4,000 Balinese marched to their death against the invaders. Afterwards the Dutch governors exercised little influence over the island, generally allowing local control over religion and culture to remain intact. Japan occupied Bali during World War II during which time a Balinese military officer, Gusti Ngurah Rai, formed a Balinese 'freedom army'. Following Japan's Pacific surrender in August 1945, the Dutch promptly returned to Indonesia, including Bali, immediately to reinstate their pre-war colonial administration. This was resisted by the Balinese rebels now using Japanese weapons. On 20 November 1946, the Battle of Marga was fought in Tabanan in central Bali. Colonel I Gusti Ngurah Rai, 29 years old, finally rallied his forces in east Bali at Marga Rana, where they made a suicide attack on the heavily armed Dutch. The Balinese battalion was entirely wiped out, breaking the last thread of Balinese military resistance. In 1946 the Dutch constituted Bali as one of the 13 administrative districts of the newly-proclaimed Republic of East Indonesia, a rival state to the Republic of Indonesia which was proclaimed and headed by Sukarno and Hatta. Bali was included in the ‘’Republic of the United States of Indonesia’’ when the Netherlands recognised Indonesian independence on Dec. 29, 1949. In 1956 Bali officially renounced the Dutch union and legally became a province within the Republic of Indonesia. The 1963 eruption of Mount Agung killed thousands, created economic havoc and forced many displaced Balinese to be transmigrated to other parts of Indonesia. In 1965, after a failed coup d'etat in Jakarta against the national government of Indonesia, Bali, along with other regions of Indonesia most notably Java, was the scene of widespread killings of (often falsely-accused) members and sympathizers of the Communist Party of Indonesia (PKI) by right-wing General Soeharto-sponsored militias. Possibly more than 100,000 Balinese were killed although the exact numbers are unknown to date and the events remain legally unclosed. Many unmarked but well known mass graves of victims are located around the island. On October 12, 2002, a car bomb attack in the tourist resort of Kuta killed 202 people, largely foreign tourists and injured a further 209. Further bombings occurred three years later in Kuta and nearby Jimbaran Bay. Bali lies 3.2 km east of Java and approximately 8 degrees south of the equator. East to west, the island is approximately 153 km wide and 112 km north to south (95 by 69 miles, respectively), with a surface area of 5,632 km². The highest point is Mount Agung at 3,142 m (10,308 feet) high, an active volcano that last erupted in March 1963. Mountains cover centre to the eastern side, with Mount Agung the easternmost peak. Mount Batur (1,717 m) is also still active. About 30,000 years ago it experienced a catastrophic eruption — one of the largest known volcanic events on Earth. In the south the land descends to form an alluvial plain, watered by shallow rivers, drier in the dry season and overflowing during periods of heavy rain. The principal cities are the northern port of Singaraja, the former colonial capital of Bali, and the present provincial capital and largest city, Denpasar, near the southern coast. The town of Ubud (north of Denpasar), with its art market, museums and galleries, is arguably the cultural center of Bali. There are major coastal roads and roads that cross the island mainly north-south. Due to the mountainous terrain in the island's center, the roads tend to follow the crests of the ridges across the mountains. There are no railway lines. The island is surrounded by coral reefs. Beaches in the south tend to have white sand while those in the north and west black sand. The beach town of Padangbai in the south east has both: the main beach and the secret beach have white sand and the south beach and the blue lagoon have much darker sand. Pasut Beach, near Ho River and Pura Segara, is a quiet beach 14 km southwest of Tabanan. The Ho River is navigable by small sampan. Black sand beaches between Pasut and Klatingdukuh are being developed for tourism, but apart from the seaside temple of Tanah Lot, this is not yet a tourist area.